Dr. Smith is married, has 2 grown children and 4 grandchildren. He currently lives on a "hobby farm" with 8 dogs, 10 cats, 18 chickens, 13 ducks, 12 horses, a land tortoise and a pond full of catfish, some of which have names. The hobby farm is appropriately named the "Waymore Ranch" because there are way more pets then there outta be. Dr. Smith enjoys being an MU fan, motorsports (cars, motorcycles & atvs) and cutting firewood to heat his home when he gets time out of the tractor seat. 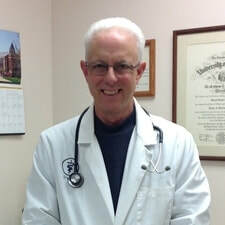 A graduate of the MU College of Veterinary Medicine, Dr. Smith has been a general practitioner for 39 years. He is a member of the AVMA, MVMA, KCVMA, AAVD & MAVP. Dr. Smith is 2 term past president of the KCVMA. Dr. Teri Schenkelberg is originally from Iowa but has lived in Kansas City for the past 25 years. 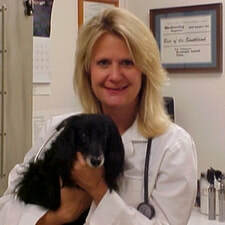 Dr. Teri enjoys all aspects of small animal medicine but has a particular interest in Internal Medicine. She has been with the Brookside Animal Clinic for 24 years. She is married with 3 children and 1 grandchild. Outside of work, she enjoys biking, walking, reading, and spending time with her family. 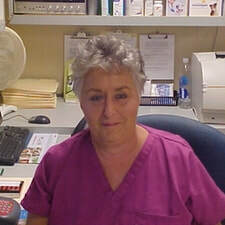 Sheldeen has been in the Veterinary field for 50 years as of this June. She has 5 children, 14 grandchildren & 8 great-grandchildren. Shel's furry friend is Sassy, an Austrailian Sheperd who will be 14 years old this year. Sassy has a cousin that is living with her and sharing her toys for now, a long hair Corgi called Shoestring or Short Legs. When not at work, Sheldeen enjoys spending time with the family, going to the lake a lot, or just find something to do together. She also loves to try new restaurants. Cathy has been passionately committed to caring for pets, and about their people for the past 50 years. She has an extensive background in obedience training and conformation show handling, professional dog grooming, and is a certified veterinary technician. Her other joys include her family, classic and cultural music, sketching, and hiking in nature. Cathy's human family sports a menagerie of 3 dogs and 3 cats. Graduated from professional grooming school in 1972, earned her veterinarian technician certification in 2002, graduated from the Arizona Institute of Equine Massage Therapy and Kinesiology in 2005. ​Danielle has a strong passion for helping and caring for animals. She grew up around dogs, cats, horses, and chickens. In her free time she enjoys fishing, riding horses, and spending time with her family. She has one cat named Mr. Kitty, and plans on getting a shelter dog in the future.